When I'm in a hurry at the airport, I avoid the moving walkways. It's faster to walk beside them. Why? Too many people just ignore the sign. It's really simple -- Stand Right, Walk Left. If you are riding on the moving walk way and standing on the left side, knock it off! Get over to the right so those of us who want to move quickly and can get past you. And don't leave your suitcase blocking the left either. 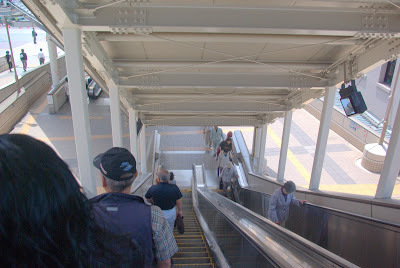 One of my favorite things about Japan was something I've never seen before -- Escalator Discipline. There are no signs, but they're not needed. This is the case for both escalators and moving walkways. People stand on the left and they walk on the right. 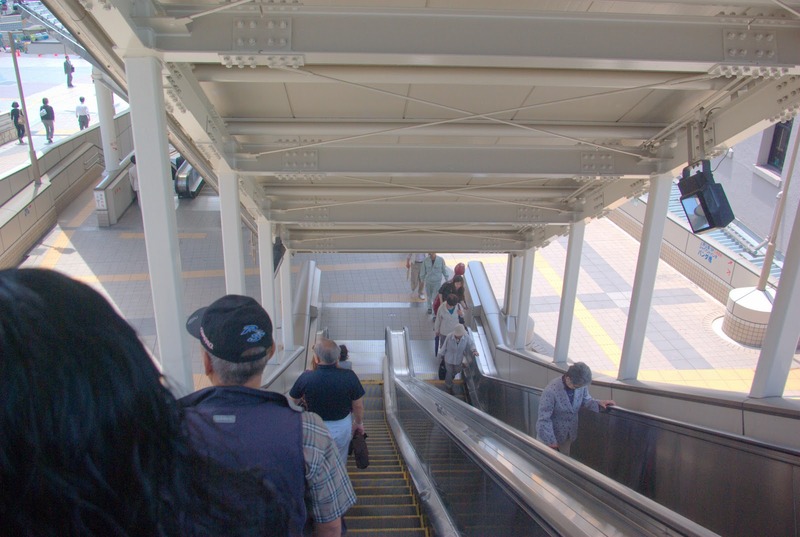 At some of the busiest train stations, hundreds of people will get on the escalators and stand on the right or walk to the left. If an escalator is mostly empty, people still stand on the left. Those in a hurry zip on by on the right, those not in a rush, patiently stand to the side. It's amazing! If we could import one human behavior from Japan to the US, I'd nominate escalator discipline. Actually, it's turning into months in Camtasia but that doesn't sounds as cool. I've been spending a lot of time this month creating screencasts for work. I'm putting together product training videos and sales program training videos. This has involved me sitting in front of the computer with my headset on, and recording scripts that I wrote. Then there's the post production stuff of trimming a second here, a half second there, resyncing the video and audio after I break it, and then finding out after I rendered the final product that I misspelled something on a source graphic. It is weird talking into my headset when there's no one on the other end. I'm at the point in my life where I no longer worry about the neighbors calling the cops because of a loud party. I'm worried they'll call the cops because I'm speaking too loudly into my microphone about SKUs, referral fees, and purchase orders. After playing back my audio over and over again, I'm glad I don't have to hear myself speak in real life. I'd just like to apologize to the world that does. Portions of the script that I wrote, I can read and record with few problems. As soon as I get to a section where I copied the text from somewhere else in the organization, my tongue trips more than a hypersensitive car alarm in a hail storm. It's been quite a learning process. If I had to offer one tip to Camtasia users, it would be this: Don't record your audio while you record your screen actions. Separating the two processes allows you to concentrate on one things at a time. And it makes editing and correcting easier. On Sunday, The GF and I headed down to Tacoma to catch the latest Cirque du Soleil show to reach the Seattle area. Alegria, the long running travelling show, took up about a third of the Tacoma Dome. We had a great time at the show. We had excellent seats in the third row on the floor and only had to deal with mild clown harrassment. They weren't nearly as obnoxious at "interacting" with the audience as they are at many other shows. It seemed like a decent crowd, but it certainly wasn't sold out. Alegría is a mood, a state of mind. The themes of the show, whose name means "jubilation" in Spanish, are many. Power and the handing down of power over time, the evolution from ancient monarchies to modern democracies, old age, youth—it is against this backdrop that the characters of Alegría play out their lives. Kings' fools, minstrels, beggars, old aristocrats and children make up its universe, along with the clowns, who alone are able to resist the passing of time and the social transformations that accompany it. I don't know what that means, either, and I've seen the show. In that respect, it's much like most Cirque shows. Alegria is an older show that first started touring in 1994 so it doesn't try as hard with the story. Since there's not as much plot in this show, I didn't burn up as many brain cells as I often do at a Cirque show in a futile attempt to figure out what the heck is going on. I had a great time at the show, but it did have a few flaws. I always feel conflicted in commenting about what I see at these shows because there it no way I could do any of that. The feats these athletes perform are just amazing. The White Singer is the storyteller who echoes in song everything she sees around her. She sings of melancholy and despair, of joy and happiness. Her luminous white gown is exquisite – underneath a bodice and skirt-frame adorned with jewels and pearls, is miles of flowing crinoline. In her dress and long white gloves, she moves like a delicate porcelain doll in a jewelry box. She conveys a surreal and, for lack of a better term, adorable innocence. There were some great acts. The fire dancers were amazing. I knew we were in for something special when they had a couple of guys strategically placed on the audience floor with extra safety equipment. The dual trapeze act was great with the added risk of them tumbling into the audience. It's not like baseball, though. If you catch a wayward performer you don't get to keep them. Many of the clown interludes started off entertaining, but seemed to go on a bit too long. And the one right before intermission, which had the richest story, didn't seem to resolve itself. The contortionists were mind blowing. The two woman twisted and bended and became pointy in all the wrong ways. We were close enough to see the expressions on their faces, as they calmly rested their cheeks upside down on their feet. They were so calm and relaxed it was amazing. They could bend backwards so far, it seemed they could lean the back of their heads on their own bellies. The skill and talent they displayed defied reality. The biggest problem with the show was the pacing. They front loaded the most compelling acts in the beginning of the show. Much of the second act was anticlimactic. That was especially the case with the last act. They took extra time to set up an impressive net for the performers. There was a swing high in the air and several horizontal bars. The performers twirled and spun around them, jumped to the swing, hung upside down, and caught one another. At the end of the bit, they did some impressive gymnastic dismounts, flew through the air and slammed loudly into the net. And that was pretty cool. The problem is that the rest of the act just didn't live up to the other acts earlier in the show. The big finale was just not on the same level as the other performances. If it appeared earlier in the show, it would have been much more impressive. If you're a first time Cirque visitor, prepare to be amazed. If you've seen a lot of Cirque shows, this is familiar territory. It's still worth seeing; it's just not the same transformative experience you may be looking for. One more note -- the snow blowing was fantastic. I'll describe what a strategic inflection point is a bit later in this book. For now, let me just say that a strategic inflection point is a time in the life of a business when its fundamentals are about to change. That change can mean an opportunity to rise to new heights. But it may just as likely signal the beginning of the end. Andrew Grove’s well known book, “Only the Paranoid Survive” was quite different from what I expected. It was more narrowly focused than I anticipated. I’m not disappointed though. I learned some new things about my industry, and it made me think more about the challenges a corporation will face. While Grove does not discuss this part of it, it’s clear to me these challenges can affect smaller organizations within a corporation. That, however, goes to my thoughts on how managers need to think strategically about their role in the organization, and is a topic for another blog post. The book is all about corporate Strategic Inflection Points. Those are points in a corporations life when suddenly the wold is a very different place. Grove’s discussion is detailed and frank. Clearly, the old world was no more. Something had changed. And the more successful the players were in the earlier industry, the harder a time they had to change with it. As Grove discusses these changes in the business environment, he often uses the phrase, “Something has changed.” Of course, whenever I see that phrase I think of Elphaba from Wicked. While Grove isn’t discussing good versus evil, he is still talking about similar things. Something happens and you can never go back to the way things were before. When it happens to a company, either the company makes major changes and grows, or it slowly contracts and dies. The trick is to spot these Strategic Inflections Points while they are happening, recognize their potential impact, and act accordingly. For Intel, Grove says that point occurred with shift to a PC compatible computer market and Intel’s decision to get out of its primary business -- making memory chips and focus on a new business -- making processors. He also discusses the Pentium flaw from 1994 and its impact on the company. Since the he wrote the book at the birth of the consumer Internet in 1995 (it was published in the middle of the Dot Com boom) he disccussed the web only briefly. Even then, though, it was obvious it would be a Strategic Inflection point, perhaps not for Intel, but definitely for the computer business in general. All this suggests that the Internet is not a strategic inflection point for Intel. But while the classic signs suggest it isn't, the totality of all the changes is so overwhelming that deep down I think it is. I have only a basic knowledge of the computer business prior to the advent of the PC compatible. I’d heard the names Wang and DEC, but besides some vague commercial memories, I couldn’t tell you much about them. Grove sketched out how the computer business worked in that era. The computer industry used to be vertically aligned... this means that an old-style computer company would have its own semiconductor chip implementation, build its own computer around these chips according to its own design and in its own factories, develop its own operating system software (the software that is fundamental to the workings of all computers) and market its own applications software (the software that does things like accounts payable or airline ticketing or department store inventory control). This combination of a company's own chips, own computers, own operating systems and own applications software would then be sold as a package by the company's own salespeople. This is what we mean by a vertical alignment. Note how often the word "own" occurs in this description. In fact, we might as well say "proprietary," which, in fact, was the byword of the old computer industry. As the industry shifted from horizontal to vertical orientations, and memory chips became a more commoditized business, Intel faced the prospect of dwindling profits and revenue. Intel ultimately made the decision to abandon its core business to focus on new opportunities in the CPU business. That decisions in the 80s made Intel the company it is today. In retrospect, its clear Intel made the right choice, but it wasn’t obvious at the time. As Grove tells the story, it was a heart-wrenching decision and a risky one at that. Grove goes on about how challenging this was to Intel’s identity. He also explains just how out of touch with the issue his executive team was. While they were struggling with the decisions, it was already happening on the ground. Over time, more and more of our production resources were directed to the emerging microprocessor business, not as a result of any specific strategic direction by senior management but as a result of daily decisions by middle managers: the production planners and the finance people who sat around the table at endless production allocation meetings. Bit by bit, they allocated more and more of our silicon wafer production capacities to those lines which were more profitable, like microprocessors, by taking production capacity away from the money-losing memory business. Simply by doing their daily work, these middle manners were adjusting Intel's strategic posture. By the time we made the decision to exit the memory business, only one out of eight silicon fabrication plants was producing memories. The exit decision had less drastic consequences as a result of the actions of our middle managers. In the case of Intel's exit from the memory business, how did Intel, the memory company, get to where only one factory out of eight was producing memory chips by the mid-1980s, making our exit from memories less cataclysmic? It got there by the autonomous actions of the finance and production planning people who sat around painstakingly allocating wafer production capacity month by month, moving silicon wafers from products where they seemed wasteful—memories were the prime example of this—to other products which seemed to generate better margins, such as microprocessors. These people didn't have the authority to get us out of memories but they had the authority to fine-tune the production allocation process by lots of little steps. Over the course of many months, their actions made it easier to eventually pull the plug on our memory participation. The executives at Intel made the decision to exit the memory business after the rest of the company was already implementing the decisions based simply on day-to-day resource allocation. When Intel finally announced the decisions to its customers, they had a similar response. In fact, when we informed them of the decision, some of them reacted with the comment, "It sure took you a long time." People who have no emotional stake in a decision can see what needs to be done sooner. Looking back over my own career, I have never made a tough change, whether it involved resource shifts or personnel moves, that I haven't wished I had made a year or so earlier. Grove explains that an executive must listen to the Cassandras in the organization. They’re in a better position to anticipate Strategic Inflection Points than management is. Although they can come from anywhere in the company, Cassandras are usually in middle management; often they work in the sales organization. They usually know more about upcoming change than the senior management because they spend so much time "outdoors" where the winds of the real world blow in their faces. In other words, their genes have not been selected to achieve perfection in the old way. In Greek mythology, Apollo gave Cassandra the gift of prophecy, but when she angered him, he cursed her so that no one would ever believer her prophecies. I’ve know some salespeople in my life who can relate to that. While everything in the book comes back to Strategic Inflection Points, Grove does offer other key business insights. Here’s how he describes the new rules of the horizontal economy. The seem like fairly basic business precepts to me. Did the world use to operate differently? One, don't differentiate without a difference. Two, in this hypercompetitive horizontal world, opportunity knocks when a technology break or other fundamental change comes your way. Grab it. Three, price for what the market will bear, price for volume, then work like the devil on your costs so that you can make money at that price. This will lead you to achieve economies of scale in which the large investments that are necessary can be effective and productive and will make sense because, by being a large-volume supplier, you can spread and recoup those costs. By contrast, cost-based pricing will often lead you into a niche position, which in a mass-production-based industry is not very lucrative. To be successful, a company has to be focused and take calculated risks. Trying to preserve as many options as possible and spreading its efforts thin will not work, according to Grove. An organization needs to choose a direction and go for it. That may limit options later on, but it is the key to success. If competition is chasing you (and they always are—this is why "only the paranoid survive"), you only get out of the valley of death by outrunning the people who are after you. And you can only outrun them if you commit yourself to a particular direction and go as fast as you can. You could argue that, since they are chasing you, you should give yourself all sorts of alternative directions—in other words, hedge. I say, "No." Hedging is expensive and dilutes commitment. Without exquisite focus, the resources and energy of the organization will be spread a mile wide -- and they will be an inch deep. Second, while you're going through the valley of death, you may think you see the other side, but you can't be sure whether it's truly the other side or just a mirage. Yet you have to commit yourself to a certain course and a certain pace, otherwise you will run out of water and energy before long. If you're wrong, you will die. But most companies don't die because they are wrong; most die because they don't commit themselves. They fritter away their momentum and their valuable resources while attempting to make a decision. The greatest danger is in standing still. When a company is meandering, its management staff is demoralized. When the management staff is demoralized, nothing works: Every employee feels paralyzed. This is exactly when you need to have a strong leader setting a direction. And it doesn't even have to be the best direction—just a strong, clear one. Mark Twain is often credited with saying something similar and more succinctly. In another note he explains that the telling others in the company what they CEO’s priorities are doesn’t matter nearly as much as showing what they are. How an executive spends their time demonstrates their priorities. One more word about your own time: if you're in a leadership position, how you spend your time has enormous symbolic value. It will communicate what's important or what isn't far more powerfully than all the speeches you can give. Strategic change doesn't just start at the top. It starts with your calendar. In theory, if you look at your calendar, the things that dominate that calendar should also match up with your job priorities. If they don't, it’s likely time to ask serious questions about calendar management or job descriptions. The book may be 10-15 years old, but the key precepts still matter. If you’re looking for a general business book, you can probably skip this one. If Strategic Inflection Points intrigues you, or you are a fan of Grove’s, definitely check it out. It’s a fairly quick read (I got through 90% of it flying from Greensboro, NC to Seattle, WA). The writing style is entertaining, if not tightly organized. I’ll leave you with a few of Grove’s thought about the Internet, right when it was starting it’s world-transforming growth. Netscape went public as I was working on this book. I knew of the company, and I thought that they had a lot of promise. But the way the stock skyrocketed on the first day it was available for public purchase and its continuing growth just blew me away. I could find no obvious rational explanation for this incredibly rapid stock appreciation. Something was going on, beyond merely a promising new company being discovered by a growing number of investors. The second thing is that, when you explore these developments first hand, you'll discover that mostly they aren't what they're cracked up to be. In the early days, getting from one place to another on the Internet took forever and when you got there, more often than not, you found a stale marketing brochure. Electronic banking is still a clumsy way to replace a stamp. And interactive television seems to have vanished even before the ink dried on the mega-announcements. It is likely that the Internet appliance is a case of turning the clock backward, given that the trend over the last twenty to thirty years has consisted of pulling down intelligence from big computers to little ones. I don't believe that the Internet is about to reverse this trend. But then again, my genes were formed by those same twenty or thirty years. And I'm likely to be the last one to know. If you’d like to see more of my book reviews, you can find them here. 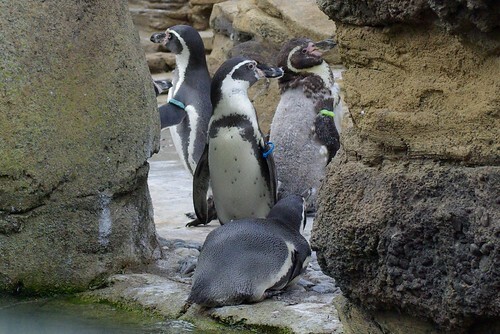 The penguin exhibit at Woodland Park Zoo has won one of the most prestigious awards in the zoo and aquarium industry. The Association of Zoos & Aquariums honored the zoo with the Exhibit Achievement Award, according to a news release from the zoo. 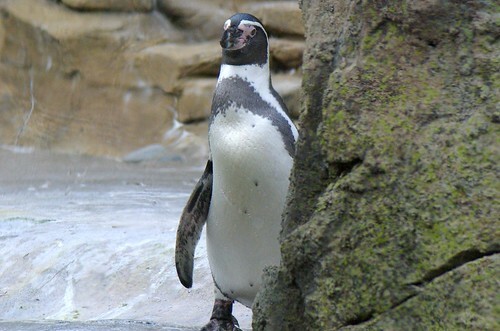 "We are honored that our peers at AZA have recognized our goal of encouraging our zoo guests to explore and discover more about the Humboldt penguins' natural history and their plight in the wild, the birds' connection to people and the collaborative work underway to help this endangered species," Woodland Park Zoo President and CEO Dr. Deborah Jensen said in the release. I'm not surprised. It's a nice exhibit. The GF and I visited it last August. 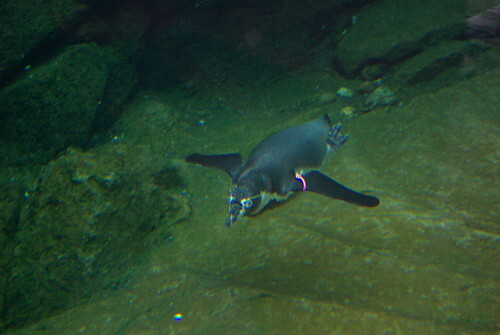 It's outdoors, but it let's you see the penguins both on dry land and swimming under water. Unlike the more traditional and mechanized displays at Seaworld, this one is filled with twists and turns. It has round windows and Plexiglas barriers. 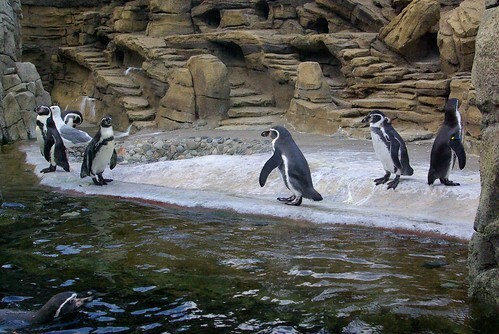 The top is open, so while the penguins can't fly or jump out, other birds can visit. 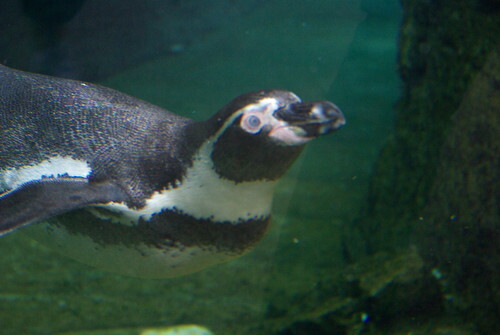 The penguins don't seem to mind. I guess they're friendly hosts. Here are some pictures I took during that visit in August, 2009. 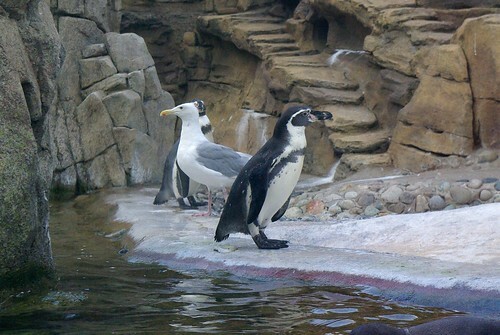 There aren't an penguins in this picture, but it is from the penguin habitat. 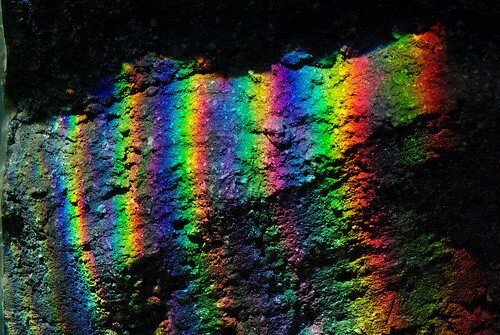 The sun shined through the windows to cast this refraction. 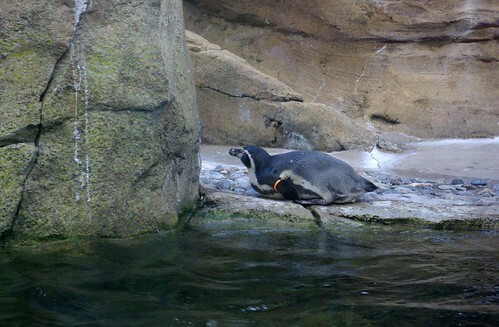 It's easy to pass an hour or more at the penguin exhibit, watching those critters go about their business. You can see more penguin pictures from this exhibit here. During the President's visit to Seattle on August 17, very few aircraft flew over the city. 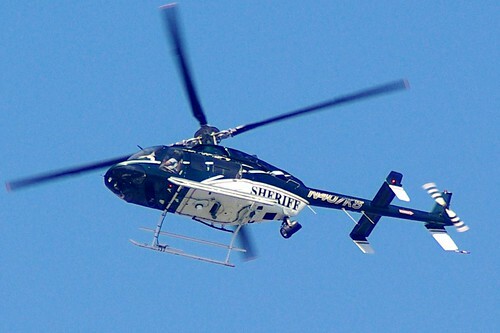 The King County Sheriff's Department helicopter was one of them. It was a gorgeous earlier in the day, and much more conducive to photography than when Air Force 1 lifted off later on. 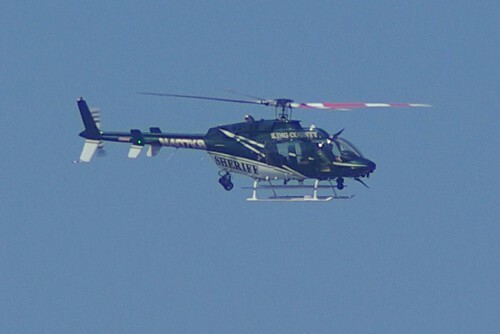 Here are a few pictures I took of the helicopter. More pictures are available in this set. Inception is a tough film to write about for two reasons. First of all, it has a complicated plot with twists and turns can be difficult to conceptualize, let alone vocalize (or in this case, literalize). Second, explaining key plot elements requires spoiling parts of the story, and I don't plan to do that. The bottom line is that Inception is a good film. It's worth seeing on the big screen, but the effects aren't so grandiose that it requires an Imax experience. If you miss it in the theater, don't worry; it's still worth seeing on DVD. Critics have compared its mind-bending properties to Memento and Mulholland Dr. I haven't seen Memento so I can't comment on that. Inception is a better film than Mulholland Dr, however. The story, while complex, is also more compelling. 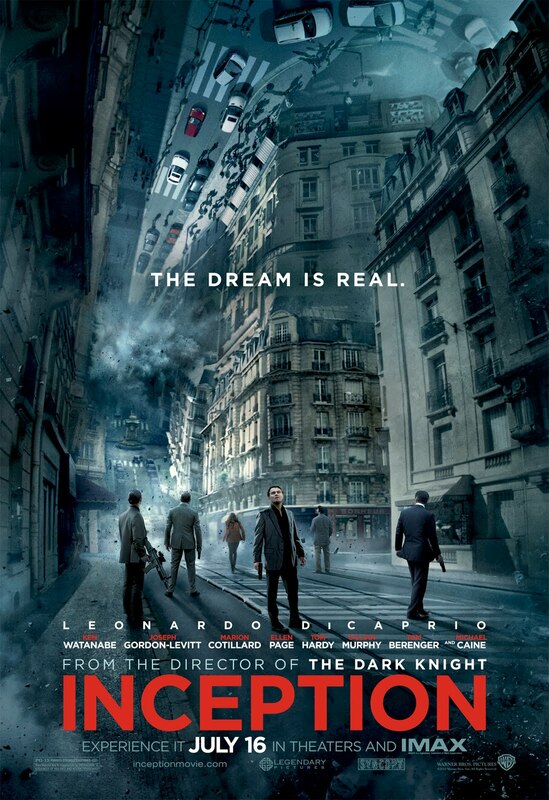 Inception follows a team of "extractors" as they pursue their schemes. Extractors can share and and enter the dreams of other people. They do this for the purpose of corporate espionage. In Inception, someone hires the extractors to implant an idea in someone's subconscious through their dreams so they think it's their own idea. The surprises and plot twist come from the nature of dreams. The characters have to be aware of whether they are dreaming or awake, and the audience needs to keep track of the various dream states as well. It's a great premise and the story telling is, for the most part, quite strong. The effects in the dream worlds are impressive in their execution, but disappointing in their vision. While it's important for the dreamer to not see things that reveal to them that they are dreaming, the fact is that people's "normal" dream worlds -- that which they accept as real at that moment and without question -- are a lot weirder and more creative that those envisioned in Inception. The mundanaity of most of the dream worlds detracts from their credibility in the film. The bigger flaw with the film is the use of the characters. It's hard to keep track or who is whom once the action starts flying. While a few of the main characters are easy to distinguish, others blend into one another. They're simply not drawn in enough detail to make it easy to tell them apart and understand what they are doing in different scenes. The other problem with the way the movie draws the characters is that I'm not sure why most of the them are there. In many "scheme" films, a leader assembles his or her team. Each team member has a distinct role, and we get to see each of them execute their role. In the TV world, shows like Leverage and Mission Impossible are prime examples of this. 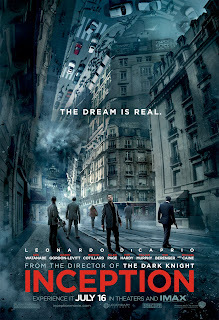 With Inception, that doesn't happen. Some of them appear to have roles, but those roles don't necessarily carry through the film. Additionally, while some of them may have a clear prep role in the plan, when they move to the execution stage, I'm not sure why everyone who participates is actually participating in that execution. The action in the dream worlds is fairly easy to follow for the most part, though I did start to lose track once we got to what resembles Hoth. Again I think part of the reason for this is that I had already started to lose track of who was whom and what they were doing. Despite those concerns, this is still a very good movie, and it's one well worth seeing. Marian Call delivers whimsical Alaskan folk funk for the Coffee Counter-Culture. She sounds a little like Joni Mitchell &; Regina Spektor raising the child of Jason Mraz &; Erin McKeown. Call's sound is always soulful, honest, and clever, loved by all types -- computer geeks, church ladies, teenage thugs, NPR listeners, and urban hipsters worldwide. 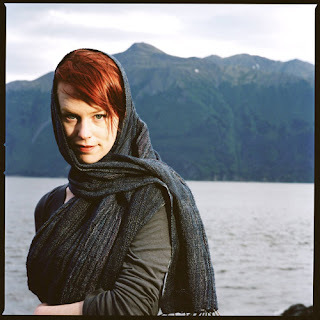 I first learned about Marian Call on the Seattle Geekly podcast. If you are interested in the geek goings on in Seattle, you should be listening to Matt and Shannon's show, too. Marian Call's music is basically Lounge meets Torchsong meets Nerdcore. When I learned should had a show coming up and -- wonder of wonders -- I was going to be in town for it, I knew I should go. I almost skipped it, however. I was tired from a prior trip, and since I hadn't purchased tickets in advance I wasn't forced to go. It just seemed easier to skip it for no good reason. I get that impulse from time to time, and I resist it. For several years, I had a sign up in my bedroom that said, "Don't not do stuff you enjoy for stupid reasons." This mantra is what got me out the door on Thursday evening. And I'm glad I went to the show. Molly Lewis opened for Marian. Molly, you may recall, also plays at w00tstock! and she often tours with Jonathan Coulton. Molly sings awesome ukulele songs about Wikipedia and the Abraham Lincoln assassination. I've now been to 5 shows where Molly played, meaning I have seen more of her concerts than I've seen of Billy Joel concerts. Molly really seems to have grown as a performer over the past two years. She appears more confident on stage with both her music and her crown banter. She's less self-conscious than she did the first time I saw her. Bottom line is that she did an awesome job. Marian Call was a surprise in a couple ways. For one thing, she is a surprisingly petite woman. With her voice I expected someone a little taller and, well, bigger. For a another, she seemed a little more self-conscious on stage than I expected. For a third, she used a mechanical typewriter as a musical instrument. That's all minor stuff, though. The amazing thing about Marian is the power and richness of her voice. There were probably about 100 people in the room (maybe more), and I think Marian could have performed without a mic if she needed to. It's not just the volume, but also the richness and energy of he voice. I can imagine listening to here sing while I sip a cocktail in a lounge in Rio De Janeiro on the hot evening of day 3 of a 4 day artificial intelligence conference. Other attendees will be whooping it up in a sports bar down the street watching soccer, while just half of the tables at the lounge are occupied by couples and singles who know they are experiencing something special, in a unique place and at a unique time as Marian slowly sings, and the waitresses slowly pour themselves around the tables. At the Fremont show she sang songs about love and science fiction -- about space travel and pick up trucks. She sang about cheerleader zombies and karaoke. She sang about Geek pride and insecurity. It was a great show. It didn't have the same zany energy you see at other shows, but that's not what this one was about. It was a lower key event and that was just fine. The show did lack a sense of intimacy, but that's likely because Marian rarely performs with a band or (I gather) a crowd this size. The show also seemed to be something of a homecoming for Marian. And that's a tough balance. I imagine that as Marian gains even more success (a given) she'll become more experienced with this format. Regardless, if you get the chance, catch her show. She has shows coming up in Vancouver, BC; Bellingham, WA; and all over the east coast as she strives to perform in all 50 states. You can see her upcoming schedule here. You can also learn more about arranging a house concert on her site. You can listen to her songs for free here. It's certainly not a bad way to spend a Thursday evening. Who’s that hiding behind a building? Oops. It may have gotten away. There it is. My. It looks like a 747 over Seattle. That’s not so unusual. But which 747? Why, it’s Air Force 1. Since I grew up in NYC, the announcement that the President is visiting results not in excitement, but in eye rolling. The traffic hassles of dignitaries can be real pain. But it doesn't happen all that often in Seattle, so folks will line the street, hoping to catch a glimpse of the President. And they did just that on 2010-08-17. The day was not without its adventure. At about 1:50 in the afternoon, I heard what sounded like two loud explosions in the city. I saw no smoke out the windows, and though it might have just been a truck. But then Twitter burst with activity. About 15 minutes later, the consensus emerged on line that the sounds were sonic booms. More details here. Apparently, while the President was at an event, someone in a float plane (who didn’t check airspace restrictions prior to taking off) violated the Seattle airspace restrictions. Two fighter jets took off from Portland, and zipped up to Seattle at near maximum speed to intercept the potential threat. It turned out to be nothing, but it certainly added some extra excitement to the day. At the end of the day, the President took off from BFI, heading north out over Seattle. The plane turned right over the Green lake area (I think) and headed east to Ohio. I got a few pictures of the aircraft through what I later realized was a really dirty lens. The hazy skies and thin clouds also made photography challenging. Regardless of who the primary passenger is as any given time, I’ve always found Air Force 1 to be one of the most beautiful birds to ply the skies. In this clip, Shatner explains his unique cadence. You can also find the clip here. The other night I took off a ring I've worn for 15 years. There's no dramatic, cathartic story behind the removal. It was all a rather practical matter. And no hobbits were harmed in the process. 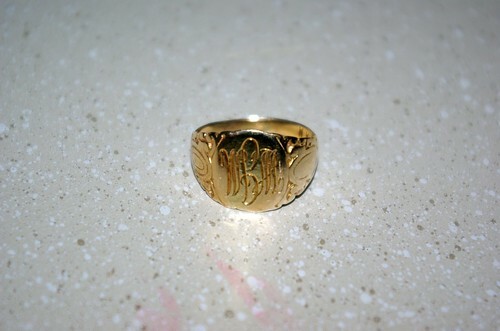 It's a ring I inherited from my father. I'm the fourth owner. Early owners included my grandfather and an uncle. All their initials are on the inside. It hasn't left my finger in 10+ years. Why? My fingers (and the rest of me) got a little too big. I put on some weight over the year and that secured the ring pretty well. Recently it began to loosen up (along with my waist band) so I thought it might be possible to take it off. I didn't try very hard though, until the other day. I noticed my finger felt irritated under the ring. It wan't intense pain, but it was definitely a "something's not right" feeling. I don't know if something got caught under there, or if there was too much moisture or not enough or something else, but it wasn't right. 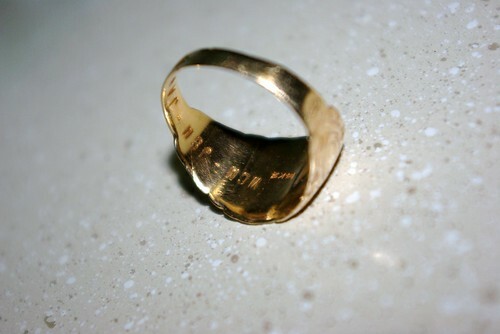 I rotated the ring 180 degrees for a few hours, and that seemed to help. Later on, I developed a plan. First, I soaked my hand in ice water for 10 minutes. I figured that might contract the skin and it's related components enough to wiggle the ring off. It may have helped; I'm not sure on that point. What ultimately brought success was the Dawn dish washing detergent. 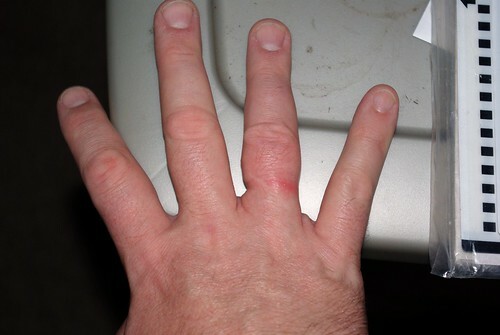 I poured some on the finger and ring and massaged and rotated the ring around my finger. I poured on more dish washing detergent and continued to massage. Millimeter by millimeter I made progress. After about 5 minutes of this the ring popped over my knuckle, as smooth as anything. The whole experience turned out to be much less harrowing than I expected. 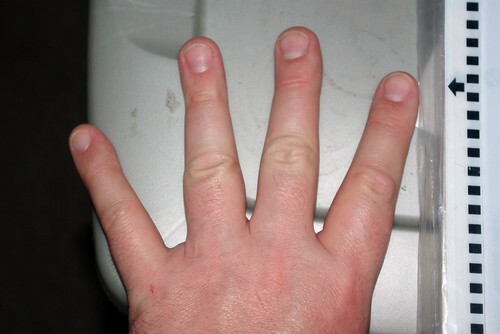 Here's how a normal finger looks. This is my left hand. And here is my right hand. Can you tell where I wore the ring all those years? It's now three days later and I still have the indentations at the base of my finger. I'm guessing I'll have those for a while. I'm still getting used to how it feels to make a fist or grip the steering wheel. I found the whole experience oddly fascinating. The ring now safely rests in my jewelry box, along with a couple tie tacks, some small rocks, and about 40 French Francs. I'll putt it back on in a few months to a year. Just as soon as a few more of those pesky pounds come off.